The Hague, October 6, 2016 – Many young people suffer from sleep deprivation. This can lead to many problems such as poor academic performance, depression and behavioral problems. Therefore, the Hersenstichting has joined hands with Chrono@Work, a spin-off of the University of Groningen, to develop a school program on sleep for high school students. 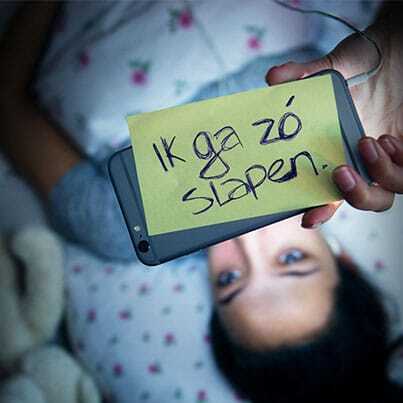 With this program; Charge your brainzzz the Hersenstichting wants to inform the youth about the importance of sleep for the brains health and encourage them to improve their own sleep behavior. Teenagers who go to high school for the first time do not only have to deal with a change in their social environment, but also with major physical and hormonal changes. “A shift of the sleep-wake rhythm of adolescents to a later phase occurs. This is often reinforced by the use of computers, tablets or smart phones late at night, “says Laura Rigter, neuroscientist and project manager at the Hersenstichting. “Teenagers fall asleep late and are expected to be early in the morning at school.” This results in a lack of sleep (i.e. sleep deprivation). For Marijke Gordijn, chronobiologist and director of Chrono@Work this is the reason to take the initiative to develop a school program for high school students. A survey conducted with high school science teachers shows that teachers often perceive a lack of sleep among their students during lessons. All surveyed teachers obserb to a greater or lesser extent, the effects of sleep deprivation among their students; concentration problems, irritability and slow reactions or students who literally sleep under the lesson are some examples. In some cases, students themselves report to the teachers that they are exhausted. The Hersenstichting puts great effort in activities meant to keep brains healthy, cure brain diseases and improve patient care. To achieve this, they do research, , provide information and carry out innovative projects. Charge your Brainzzz is a good example of such a project.